# 1 Kindle Bestseller in Meditation# 1 Kindle Bestseller in Self-Help/MotivationA gift book filled with more than 365 happy thoughts to empower you and get you through each day.REVIEWS"It may just become the Kindle book that you are most likely to open each and every day for the next 12 months." KINDLE NATION DAILY"I love this great new book... Shadonna has searched and found the secret of happiness and is sharing it with us in this valuable book....This is a perfect book to buy for a friend because you will be helping to spread happiness to the ones you love. "~LIONEL KETCHIAN, AUTHOR OF FOOD FOR THOUGHT AND FOUNDER OF THE HAPPINESS CLUBS"Written with humor and wisdom, Shadonna Richards has produced a book that is both fun to read and loaded with techniques for helping all of us achieve true, deep, lasting happiness." 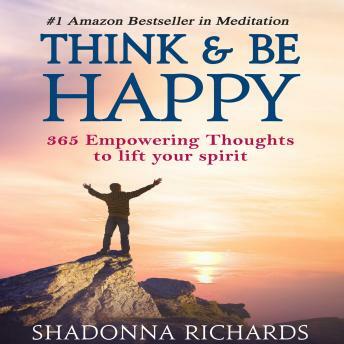 ~BOB NOZIK, MD, CO-FOUNDER OF THE AMERICAN HAPPINESS ASSOCIATION AND AUTHOR OF HAPPY 4 LIFE"Shadonna Richards shares her words of wisdom in a way that will have you telling your friends to get their own copy...We need more books like this one!" ~CATHERINE PULSIFER, EDITOR, WWW.WOW4U.COM (WORDS OF WISDOM 4 U)The suggestions expressed in this book are in no way to be considered a substitute for consultation with a licensed physician or psychologist. Full text in print and electronic version.